If you want less restriction and improved airflow to your engine for increased power and better fuel economy, but don’t get these benefits from your air filter at the expense of engine protection. 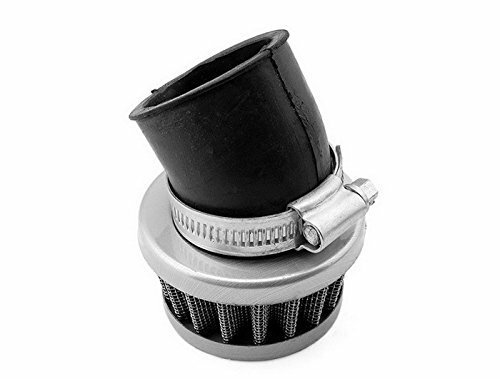 As well as your old filter has seen too many cleanings or you¡¯d just like to upgrade, you can not wait to get a high performance air filter now. The most important is it can washable and reusable, Then let the filter dry naturally. NOTE: Please be carefully check the goods appearance, size, shape and then compare your old part before ordering, thank you. High quality, long service life,attractive design easy assembly. Package includes: 1 x Air Filter,as the picture . High Quality£¬Steel Gauze Bonded onto a Rubber Collar. Attaches to the Carburettor Flange by a Jubilee Clip,which comes with the Air Filter. Bent Rubber Tube Inner Diameter:Approx. 35mm/1.38 ; Come with 34mm~46mm adjustable clamp, easy install .